Animals feel pain much in the same ways that humans do, although they may not display the same signs as people do. 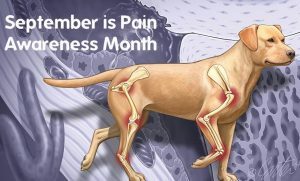 In general, we tend to underestimate the degree to which our pets may be experiencing pain on a daily basis and the negative impact this has on their quality of life. Cats for instance often hide their pain being that they have the unique properties of being prey animals as well as predatory animals. Depending on breed and individual personality’s pain can be displayed very differently. Pain can cause disruption in sleep patterns, eating habits as well as behaviour and personality changes. Inflammation is a biological response by the body to try to remove the harmful or irritating stimuli and start the healing process. Inflammation brings a lot of good healing properties to an injured area; the issue is that inflammation itself encourages more inflammation which is where pain comes in. Chronic inflammation is often missed due to the slow onset and subtle signs your pet may display. This type of inflammation is not healthy or helping to heal an acute or rapid injury. Osteoarthritis is a very common example of chronic inflammation. Osteoarthritis, also known as degenerative joint disease (DJD), is defined as the progressive and permanent long-term deterioration of the cartilage surrounding the joints. Arthritis is the medical term for inflammation of the joints, while osteoarthritis is the term referring to a form of chronic joint inflammation caused by deterioration of joint cartilage. Older pets are at the highest risk to develop this type of chronic inflammation. Symptoms of osteoarthritis vary by individual’s level of pain tolerance. Your dog or cat may exhibit a decreased level of activity, occasional lameness or limp, and a stiff gait that worsens with exercise. These symptoms may increase with exercise, long periods of inactivity, or cold weather. You may also notice changes in activity patterns, for example your senior cat may not long jump up on the couch to look out the window, or your older dog may find slippery floors scary and hard to navigate. Pain from arthritis can also change behaviour; chronic pain can change the temperament of the nicest pet into one that may snip or growl at owners who are just trying to help with manoeuvring through life. Appetite can be affected by pain in your pet; just walking to the food bowl may seem like a huge feat for a pet in pain making them less likely to enjoy their meals in turn then eating less. In cats and dogs you may notice over grooming in certain areas, since grooming releases endorphins (happy hormones). There is a wide variety of reasons that your pet may develop arthritis such as trauma, abnormal wear on joints and cartilage, or a congenital defect present at birth such as an improperly formed hip (also known as hip dysplasia). Obesity is another factor for osteoarthritis, as it increases stress on joints. In addition to added stress on the joints, studies have shown excess fat in the body can increase inflammation of the internal organs. A diagnosis of osteoarthritis may be done based on an assessment symptoms observed at home, such as decreased activity or stiffness, as well as an examination which can reveal a decreased range of motion, stiffness, swelling(inflammation) and pain in the joints. Radiographs can be helpful in the diagnosis process if the arthritis is due to any condition, such as hip dysplasia. The main goal for medical management of osteoarthritis is to control the symptoms of the disease, as there is no cure. Medications such as non-steroidal anti-inflammatories (NSAIDS) work well to relive the pain associated with arthritis (remember arthritis means inflammation of the joint). NSAIDS work well in conjunction with supplements that can help improve joint health, such as glucosamine, chondroitin and omega 3 fatty acids. When a dog has hip dysplasia or ages, the body does not have the building blocks available to build enough new cartilage to keep up with the breakdown of the old cartilage. Glucosamine provides the building blocks to synthesize new cartilage. There is always a low level of destructive enzymes found in the joint, but when injury or abnormal wear occurs, the destructive enzymes and agents increase causing cartilage destruction to accelerate. When chondroitin is added to the diet it helps to reduce the level of these destructive enzymes. Omega 3 fatty acids work to naturally reduce inflammation. Cartrophen is another supplement that works by stimulating the joint lining cells to help produce thick healthy joint fluid to keep the joints lubricated and moving smoothly. If you think your pet could benefit from any of these products don’t hesitate to give us a call for information on recommended products for joint health.